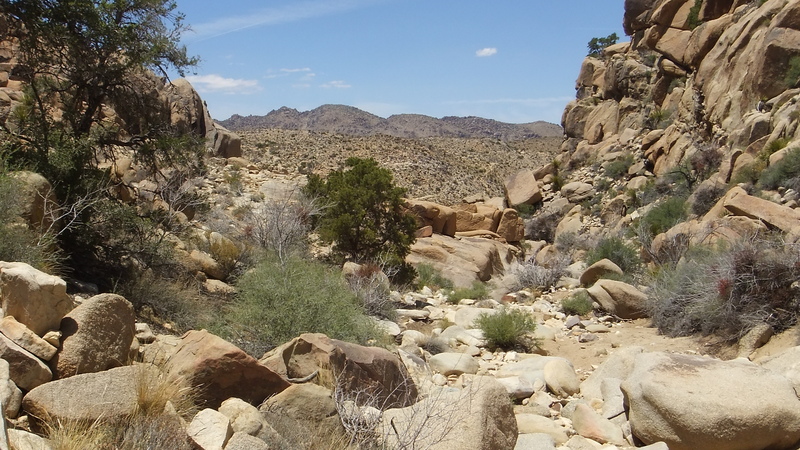 SNAKE WASH AT TREE NATIONAL PARK is the main feeder channel into Desert Queen Mine’s dam. 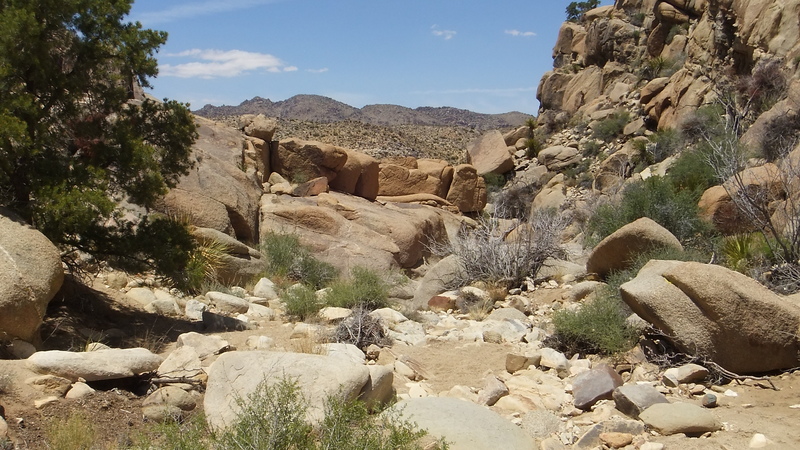 The wash continues past the dam and through Gold Dust Gulch, then makes a hard right turn below the mine shafts where it courses past a rock-climber area known as Loveland. 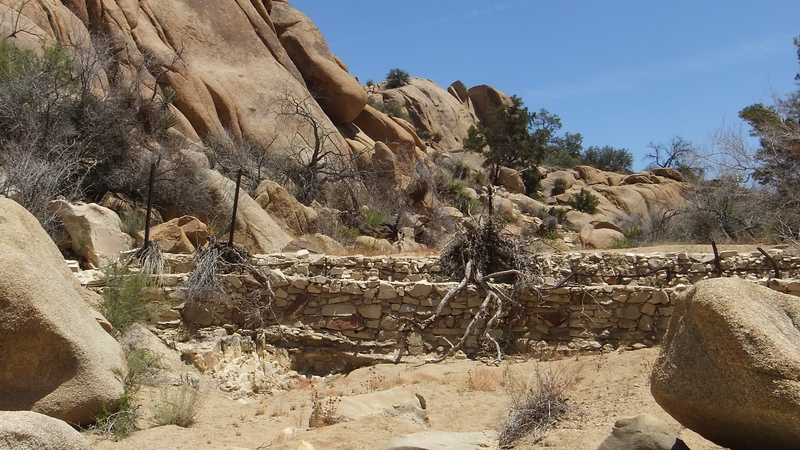 This large drainage wash finally exits the National Park at its northern entrance. 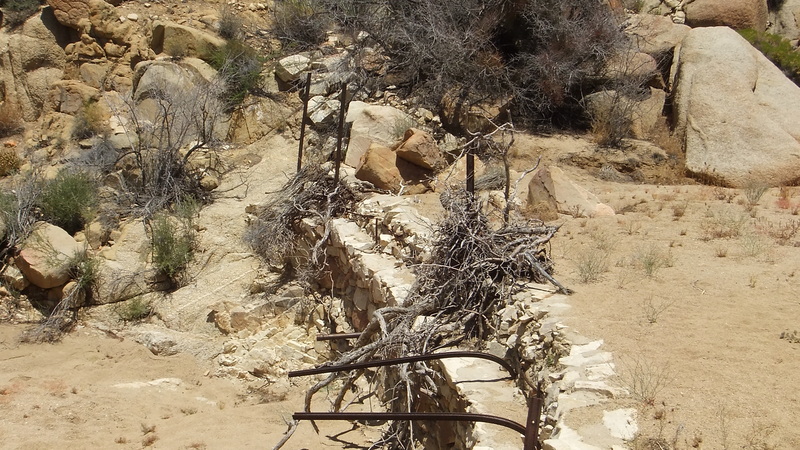 Hikers going to Oz and Munchkinland with its historic Pinto Wye arrastra will cross this same drainage channel. 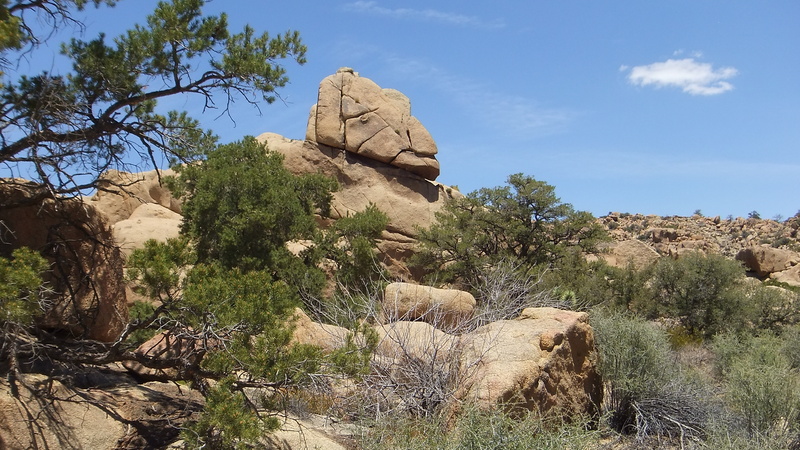 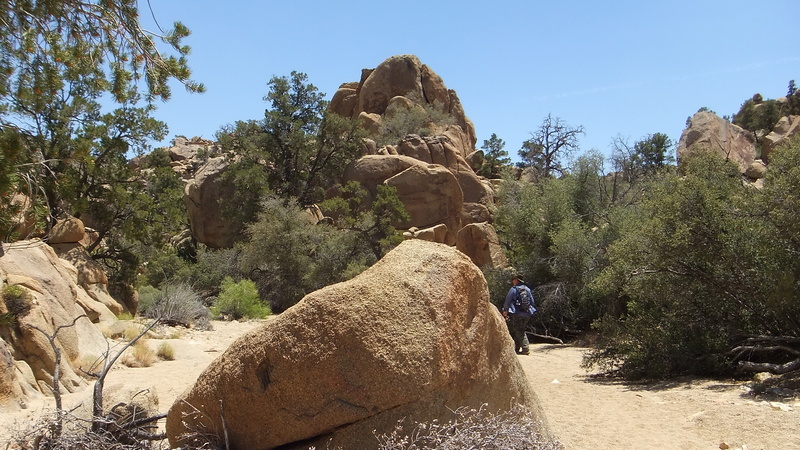 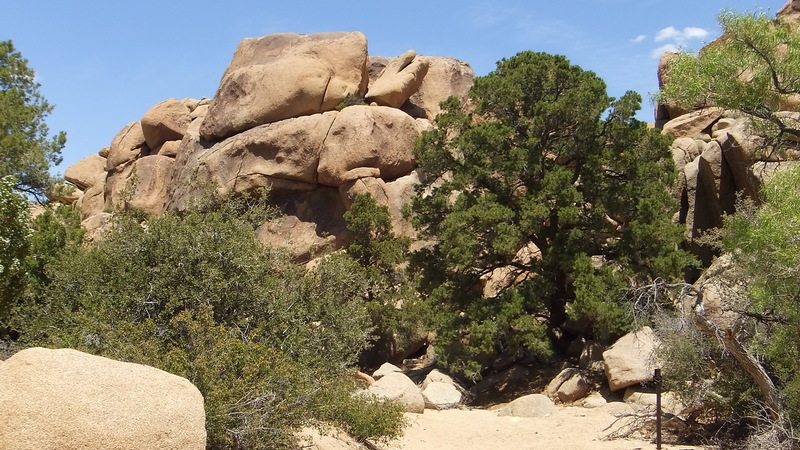 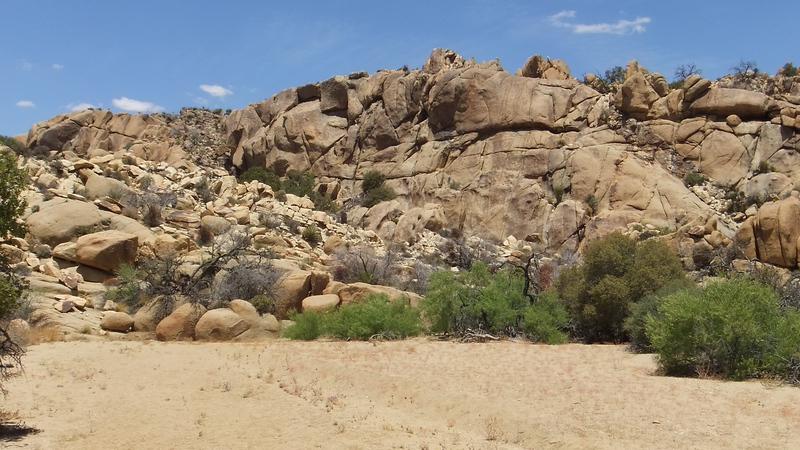 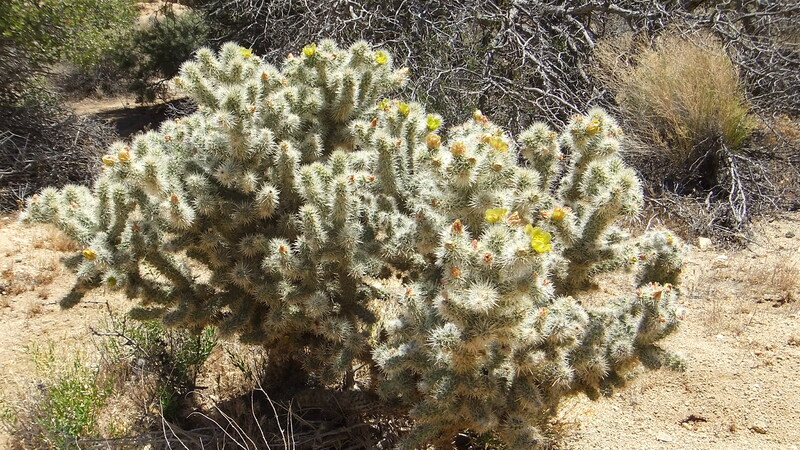 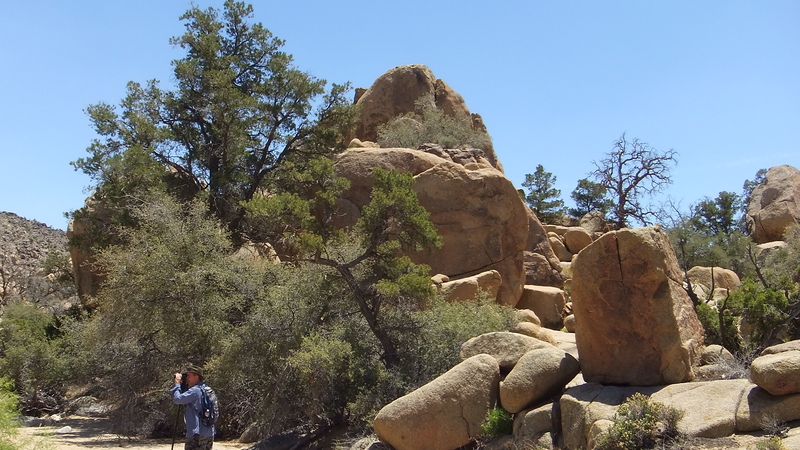 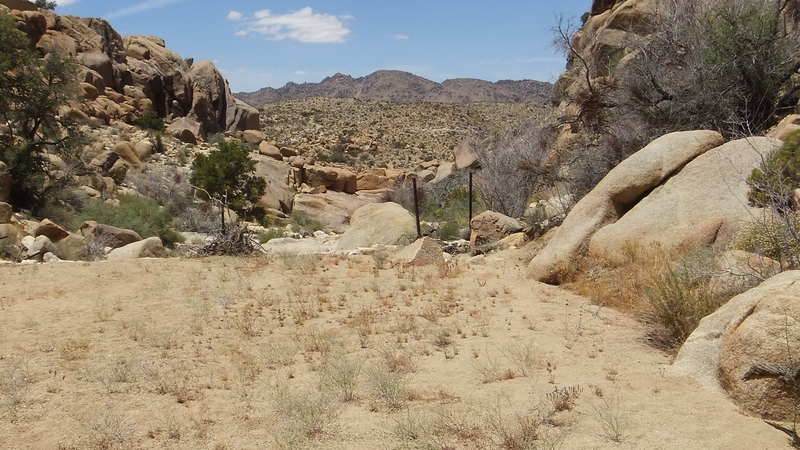 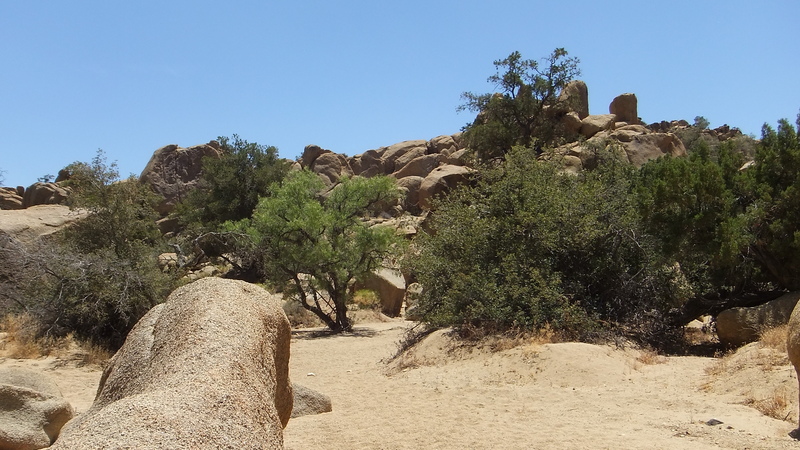 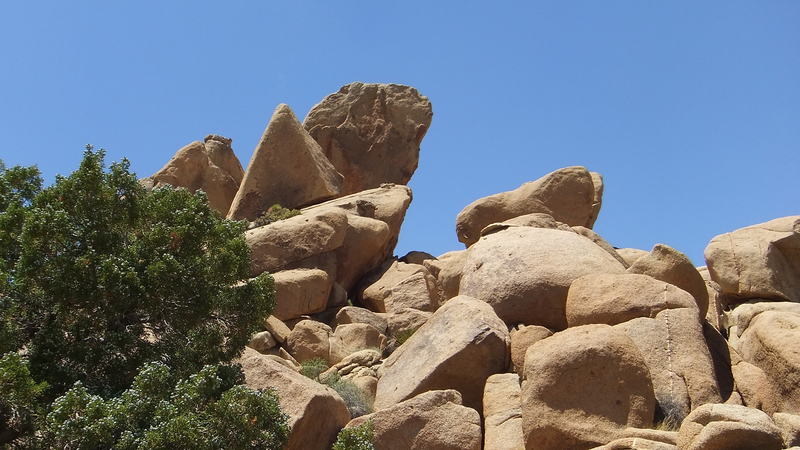 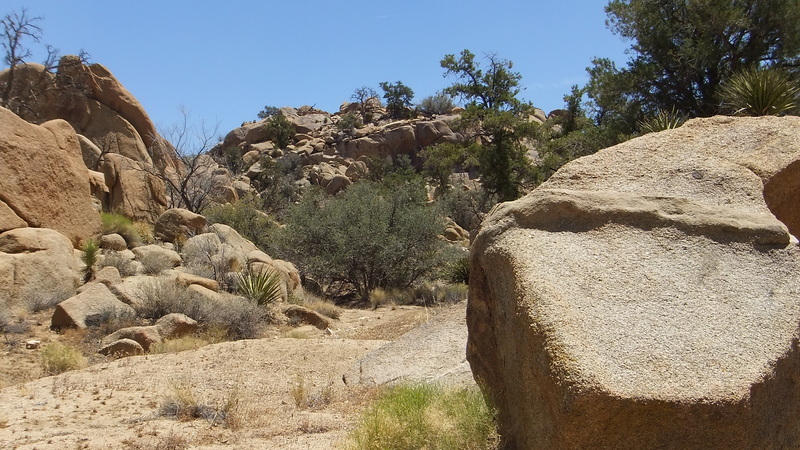 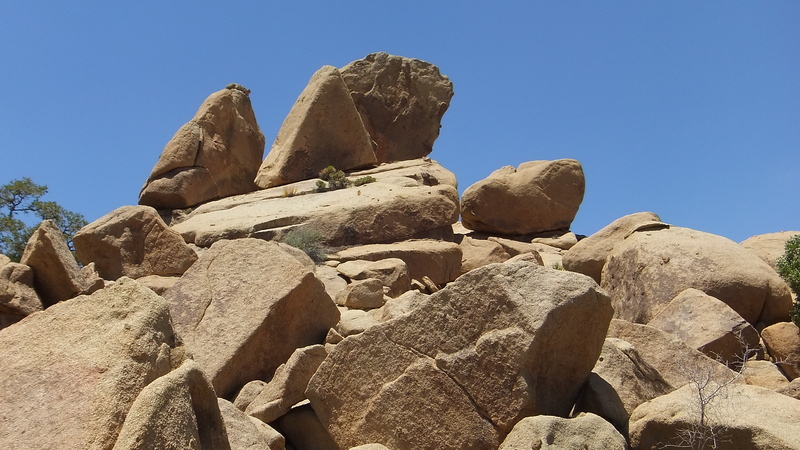 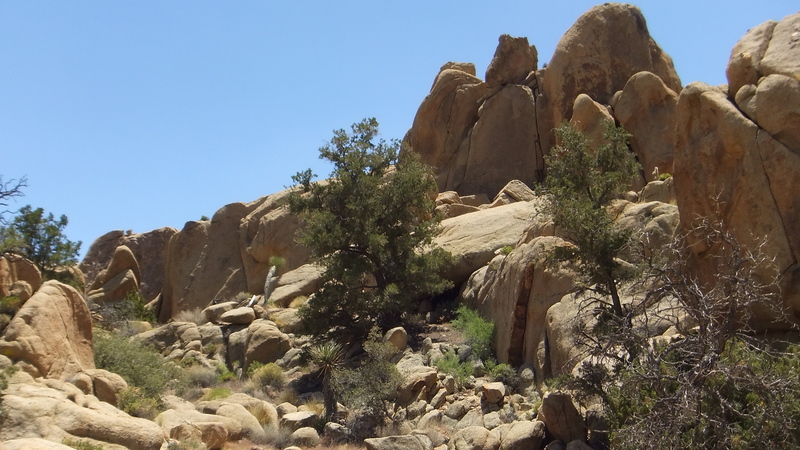 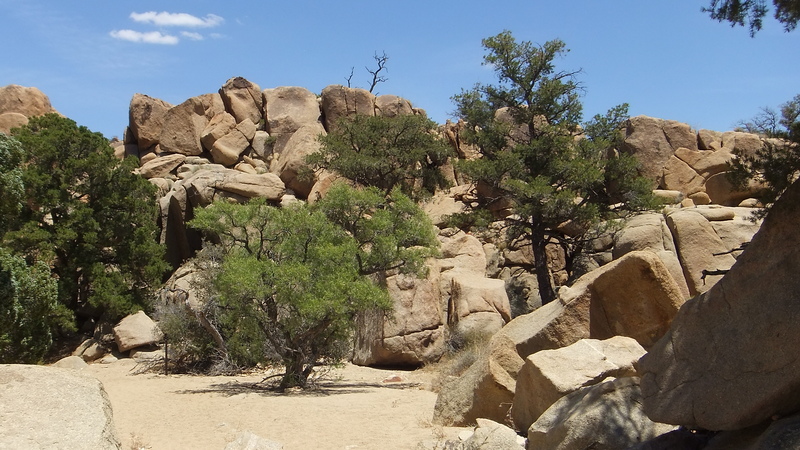 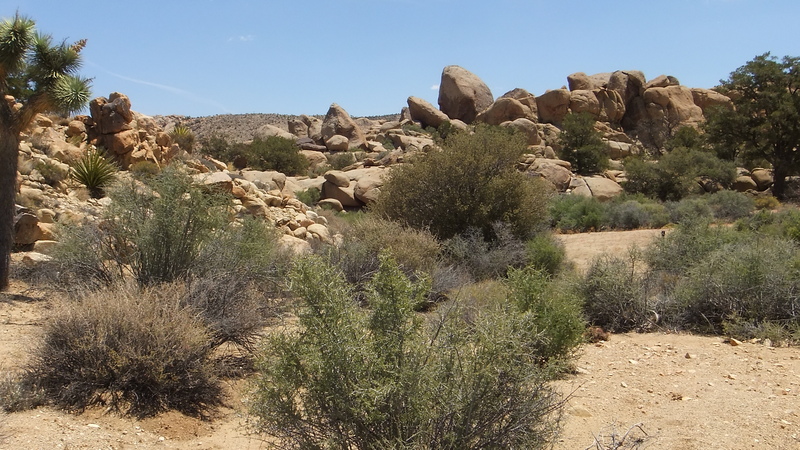 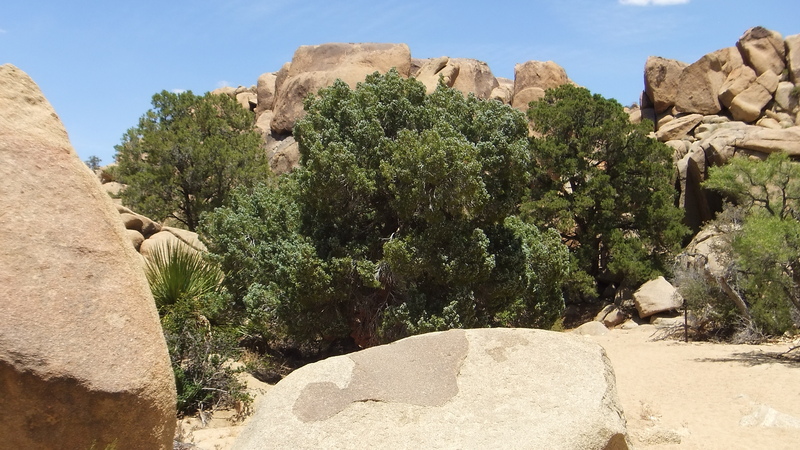 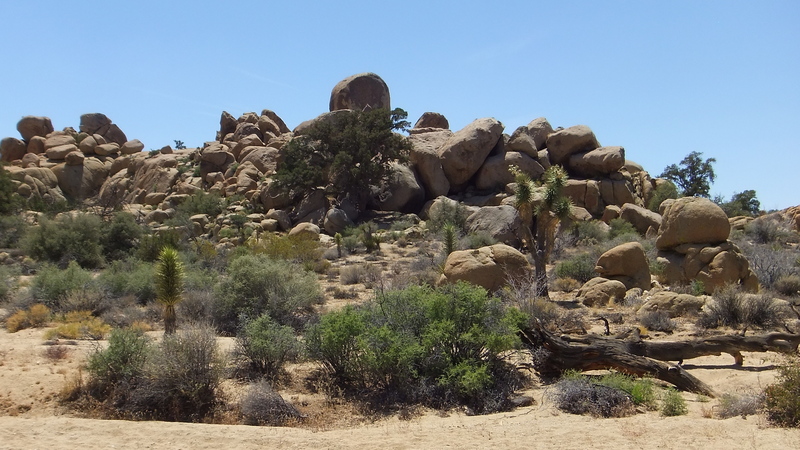 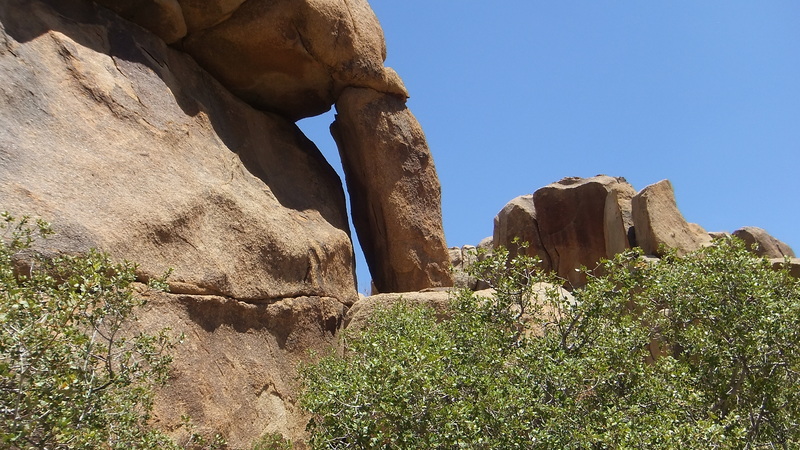 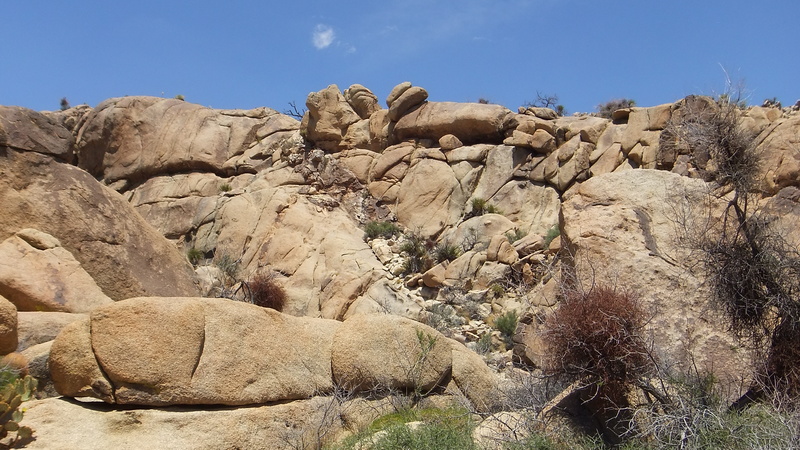 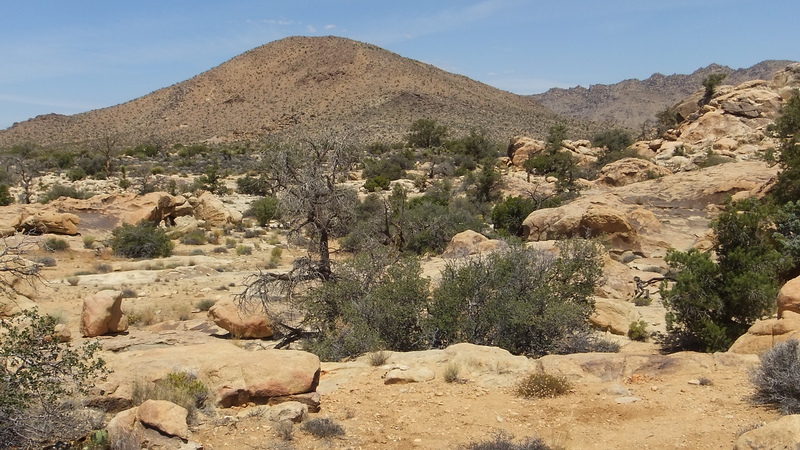 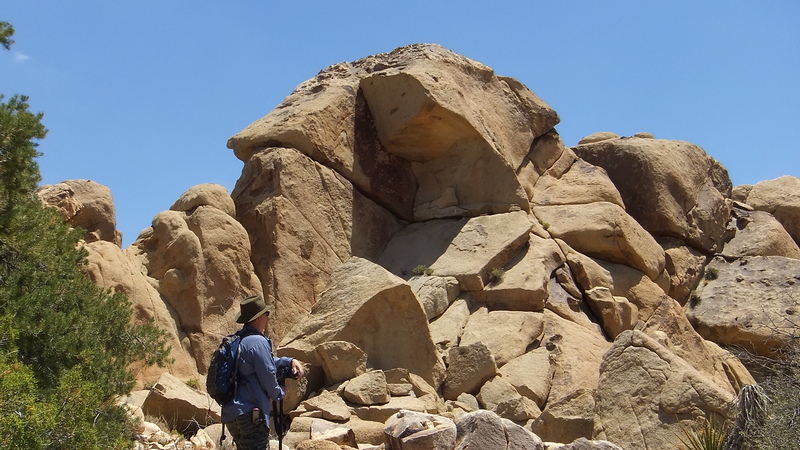 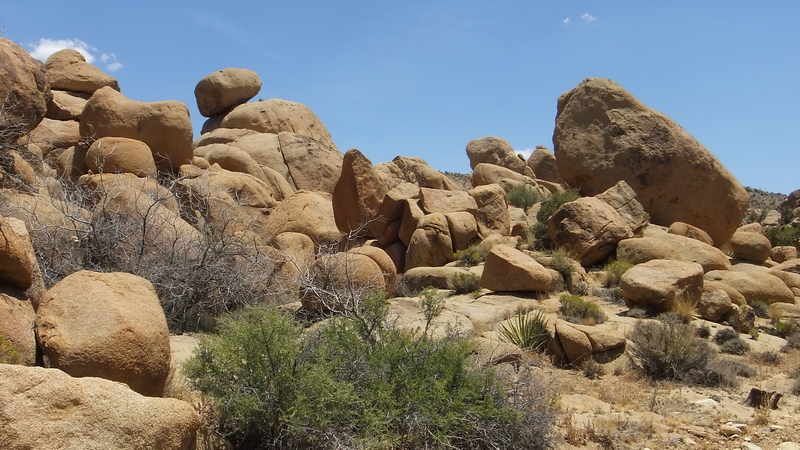 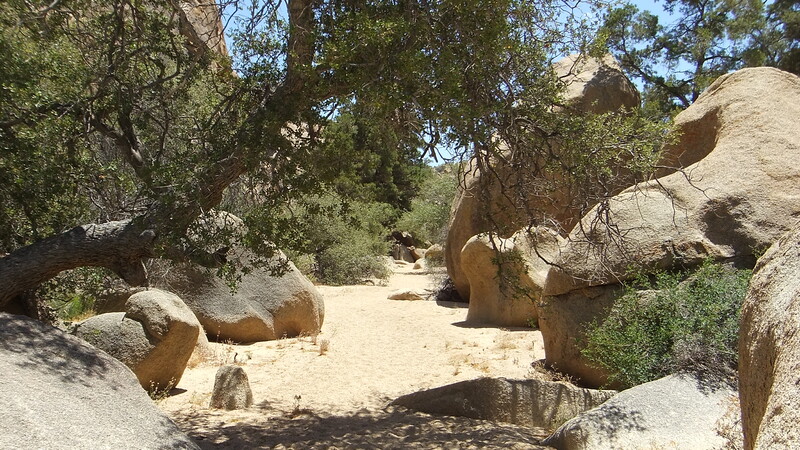 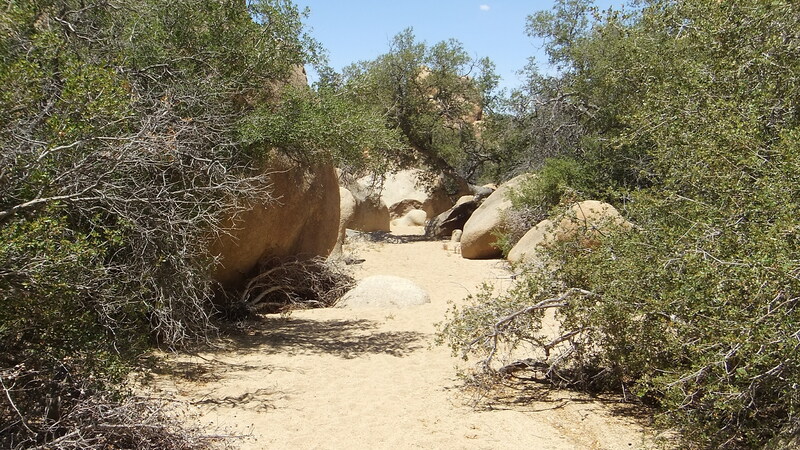 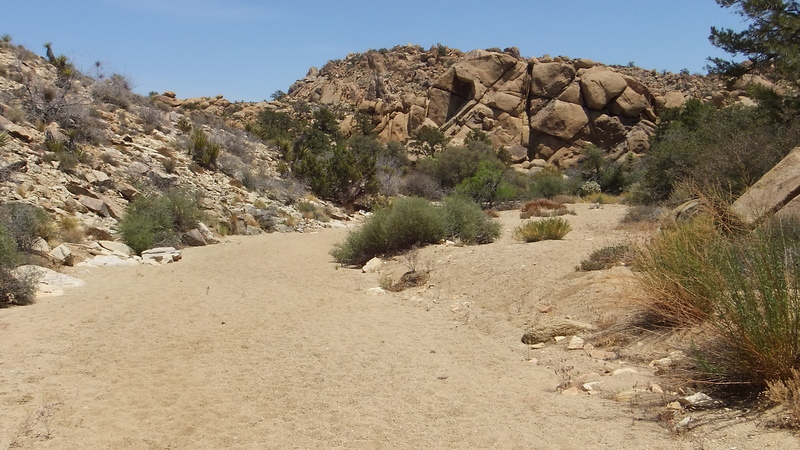 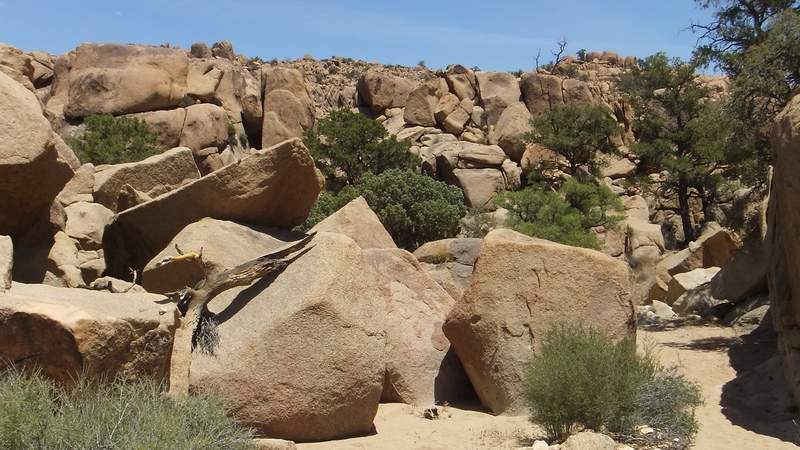 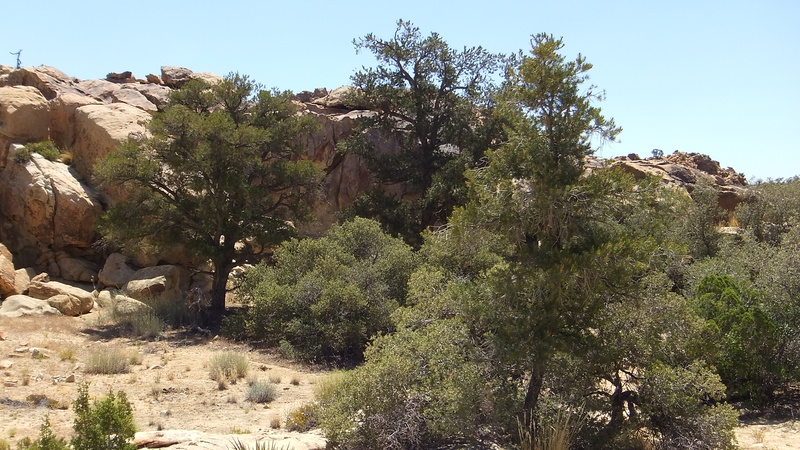 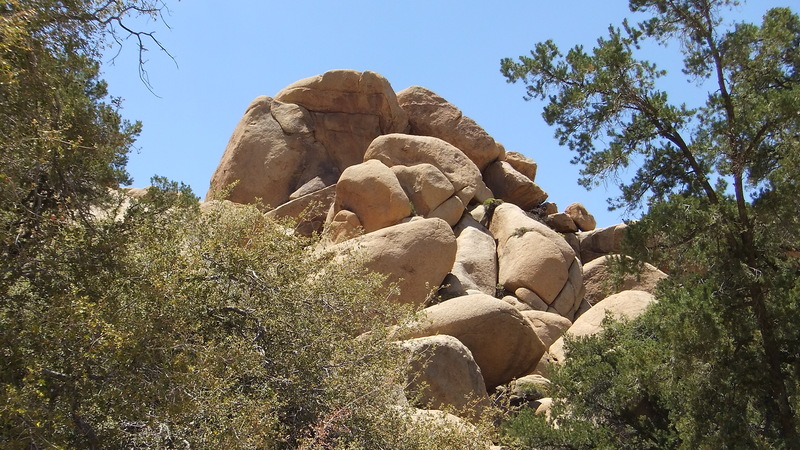 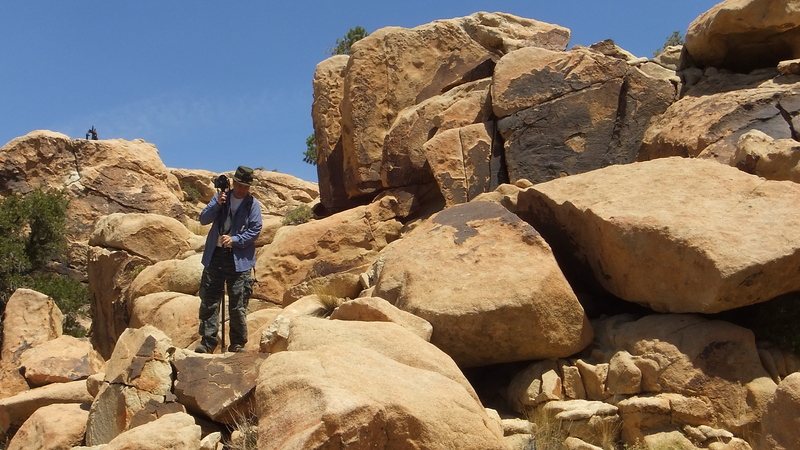 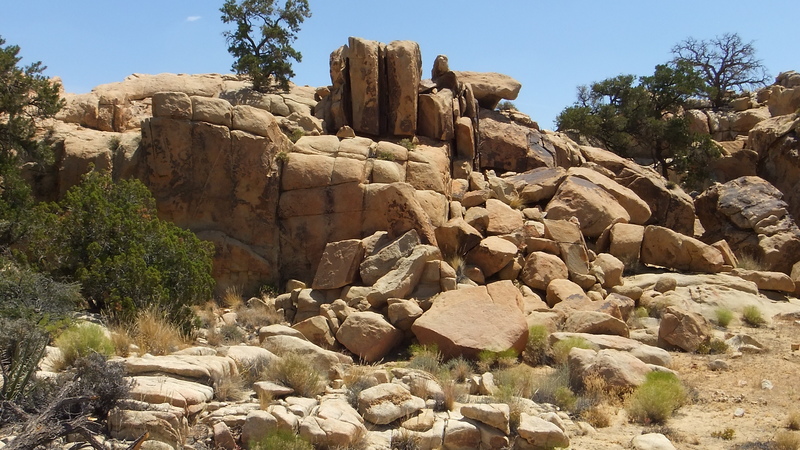 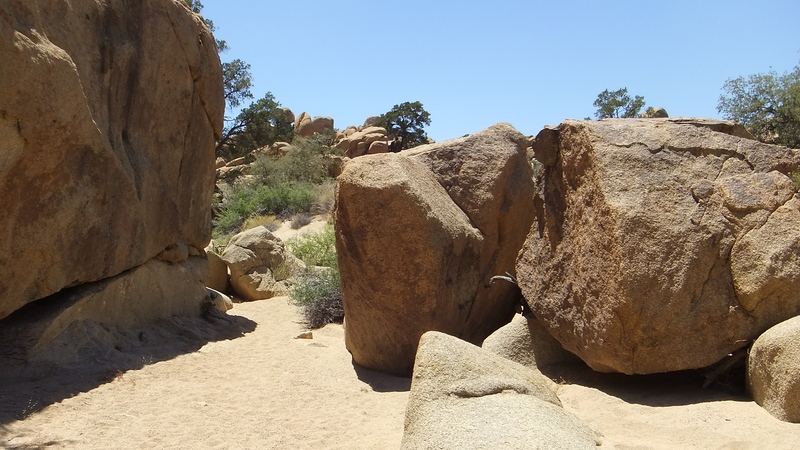 Snake Wash offers the hiker a varied terrain, wonderful rock piles you can explore, many of which are oddly shaped, intricately balanced, and there are also some rock-climber formations This is an area where early nomads rested and carved petroglyphs on the rocks. 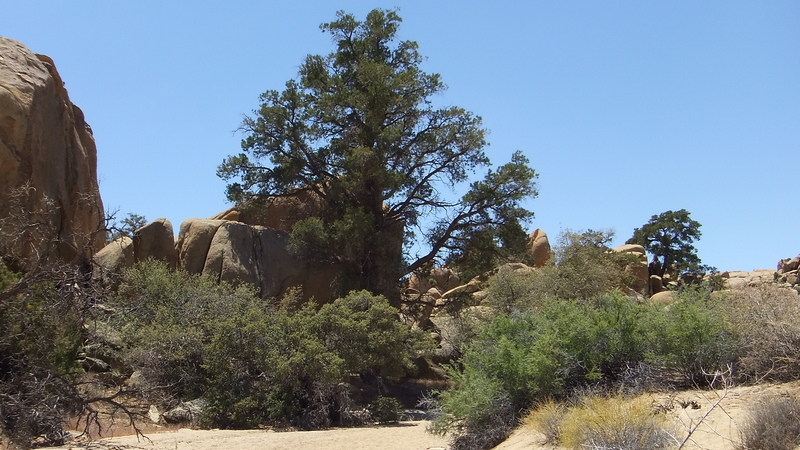 Large shady pine trees invite you and provide welcome relief from the sun. 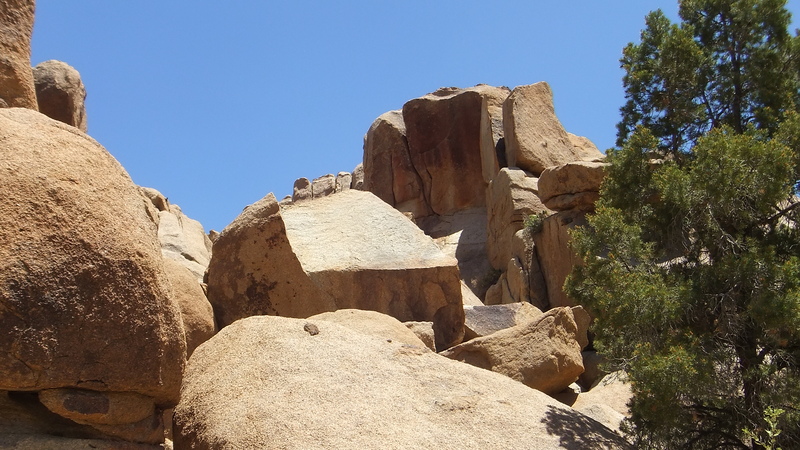 There are views every which way. 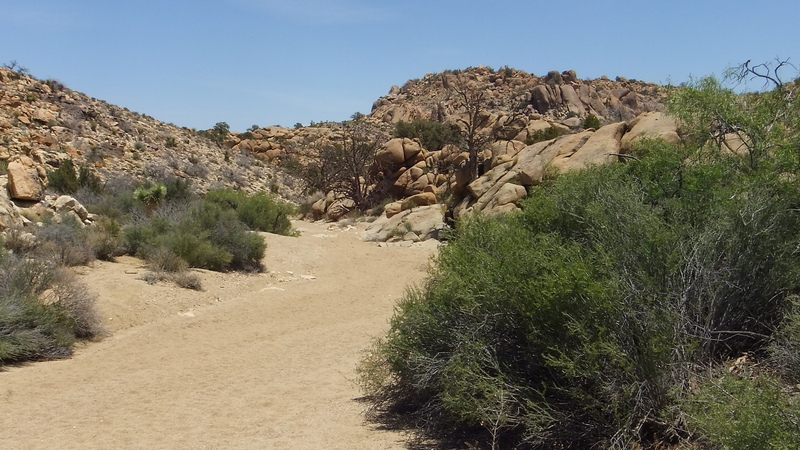 A short stroll up some of the sloping rises either side of the wash give a much better indication of the surroundings. 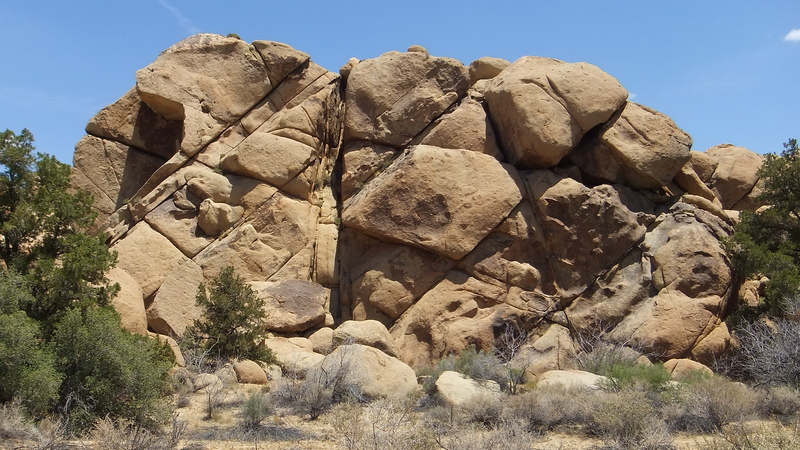 At the point where the dam was built there is a large hillside playing host to major rock climbing features like Mother Lode Wall, Noodle Rock, Poodle Rock, The Tailings. 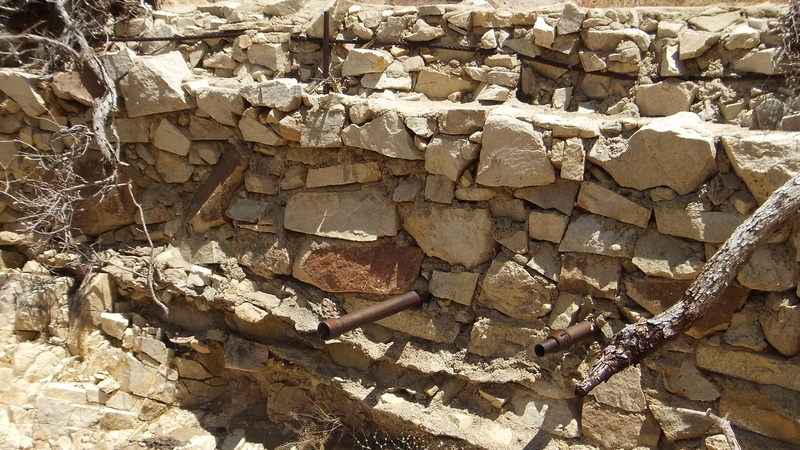 Those are at the wash level. 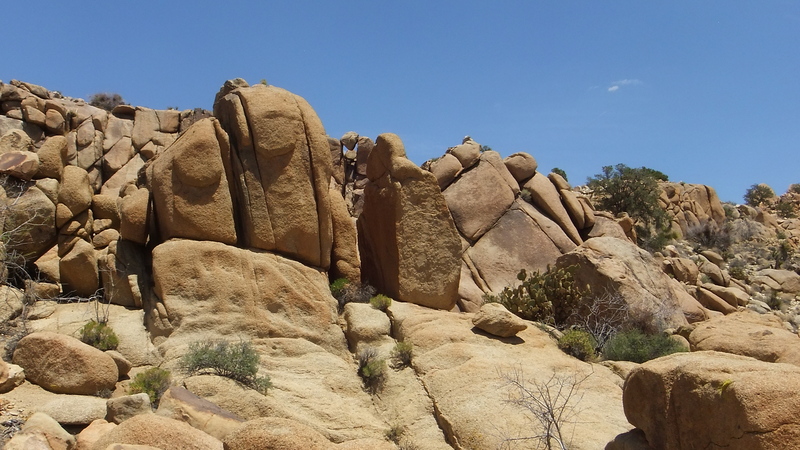 Further on up above is a marvelous vantage point hosting Scary Tree Pinnacles, Queen Crimson Dome and numerous other named formations. 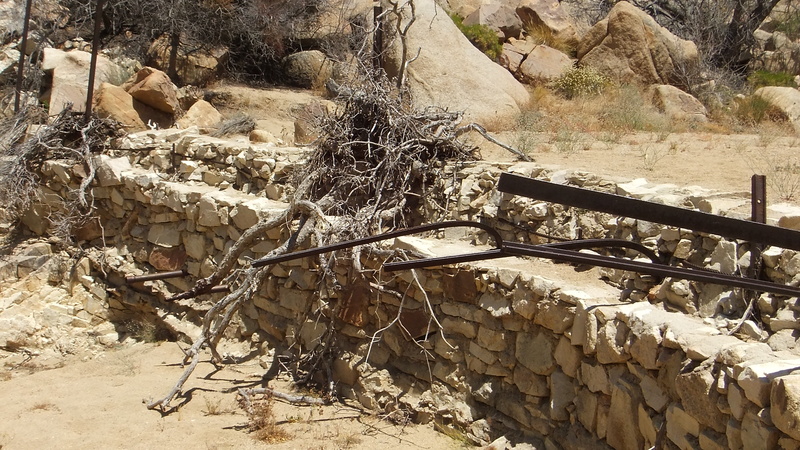 The wash snakes through a final large S-curve where you are presented with a well built, century-old old miner’s dam. 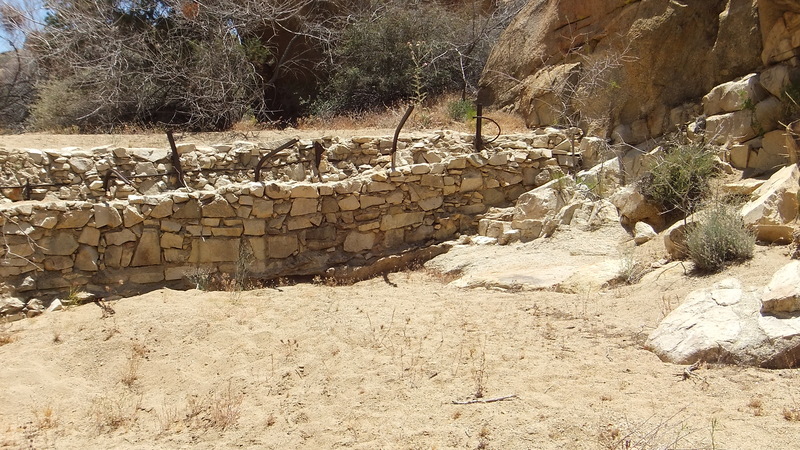 No records remain concerning when the two-tiered water catchment was first constructed, or who built it. 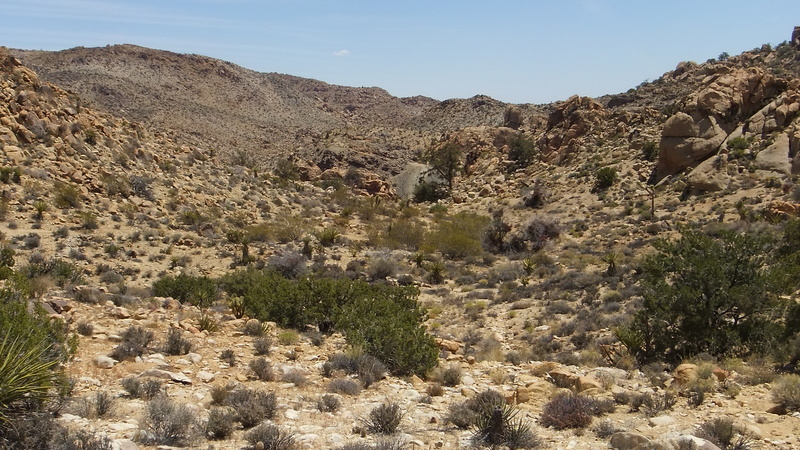 The view down the way from the dam is dominated by The Tailings rocks on the left, Noodle & Poodle Rocks on the right, while several hundred yards further can be seen the main Desert Queen Mine works, the plated mine shafts, and rubble-gray tailing piles. 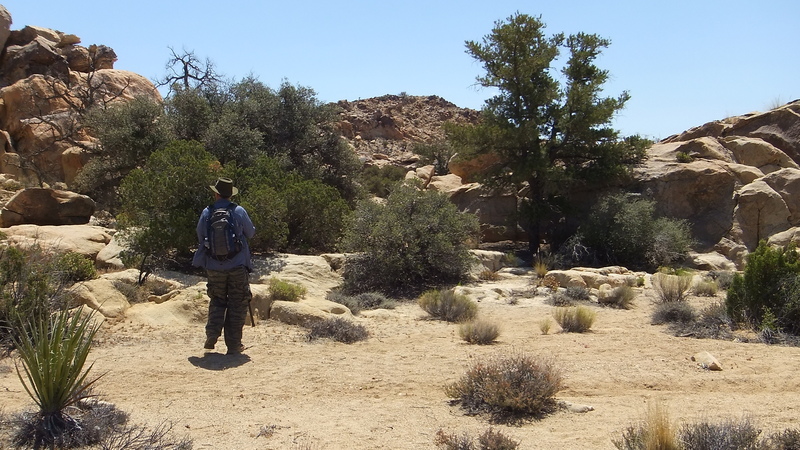 My friend Elliot Koeppel surveyed the Native American Habitat area on an earlier solo venture, which lies near the start of the wash (at the D.Q. 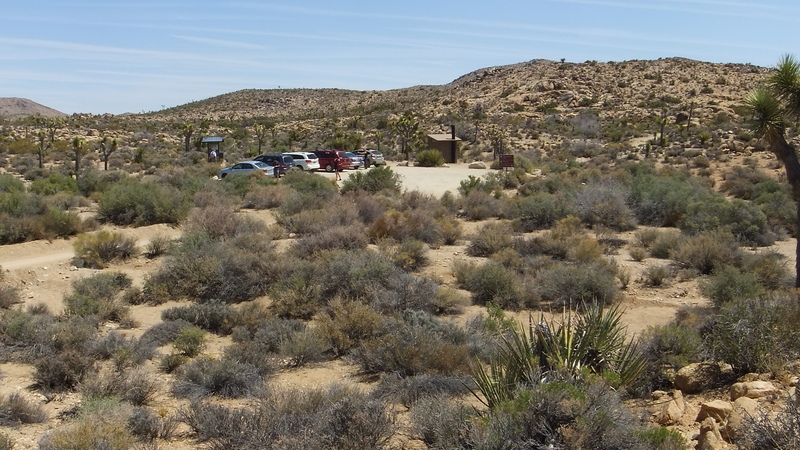 parking lot). 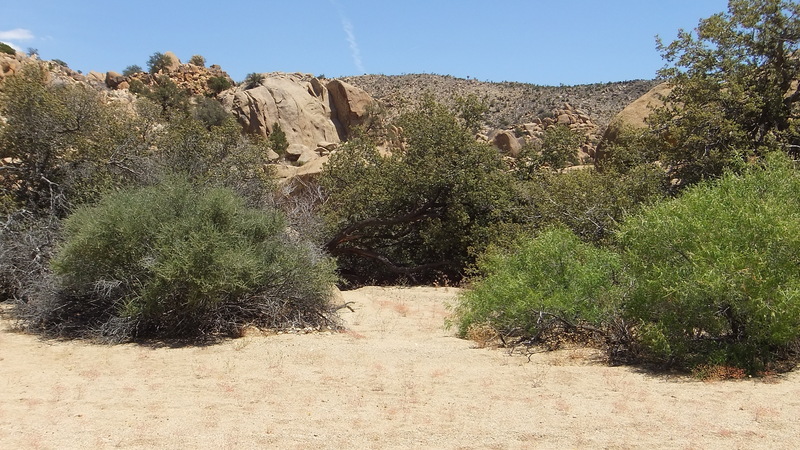 There he discovered several petroglyph walls, and signs of early encampments. 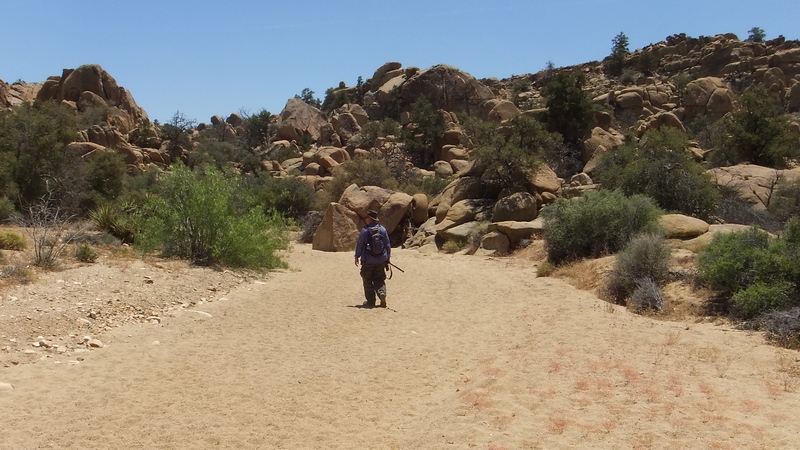 On this trip, we descended the gentle slope the whole way to the dam, which lies a little less than one and one-half miles from the car park. 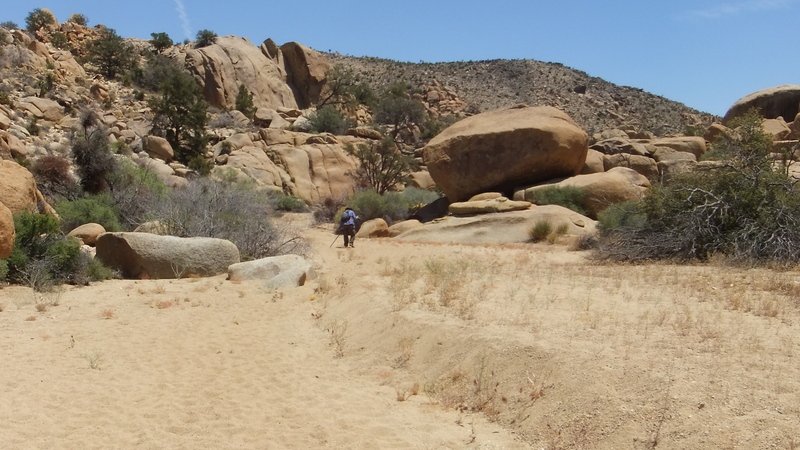 Prepare for long stretches walking in the wide sandy wash. 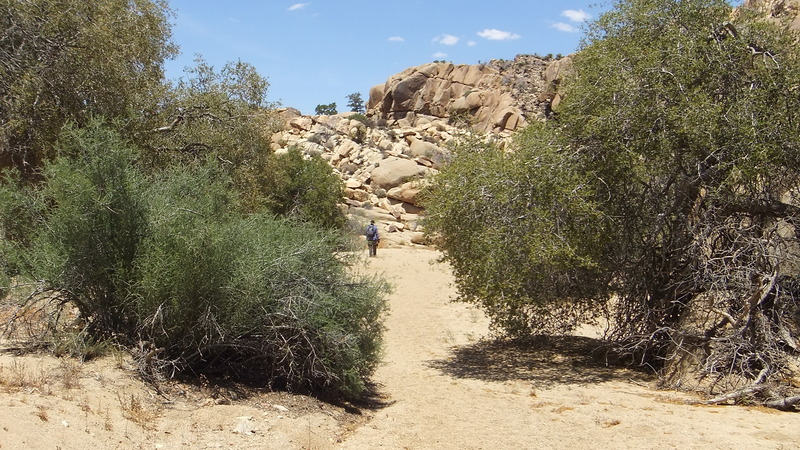 Your leg muscles, calves, and buttocks will thank you by reminding you for several days thereafter of the fine exercise you got!